Shirts With Random Triangles: Oregon St. LB Rommel Mageo Heading To Ole Miss As A Graduate Transfer. 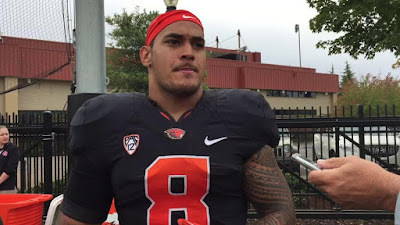 Oregon St. LB Rommel Mageo Heading To Ole Miss As A Graduate Transfer. Rommel Mageo. Image via statesman journal.com. Rommel Mageo is an ex-Beaver. The linebacker has announced that he will transfer to Ole Miss following his graduation from Oregon State. As a graduate transfer, Mageo will be automatically eligible to play for Ole Miss in the 2016 college football season. Mageo is described by Building the Dam as "the Beavers' most experienced linebacker." He was responsible for 87 tackles for Oregon St. in 2016, with 47 solo tackles, and 40 assisted tackles. Originally from Pago Pago, American Samoa, he stands 6'2, and weighs 233 lbs.